In our old house we had a filing cabinet where we kept everything tidily filed away. However, we don’t have room for the filing cabinet in our current office, it’s currently sitting in our garage. Filing cabinets are great for keeping your paperwork organised, but they are large, heavy and hard to find a space for in many homes. I needed to come up with another solution for organising the finances and filing that we wanted to keep within arms reach in the office and with many businesses improving ways of paying bills it’s helping to reduce the paper clutter. As well as filing billing paperwork or emails in an organised manner, there’s also paying them. 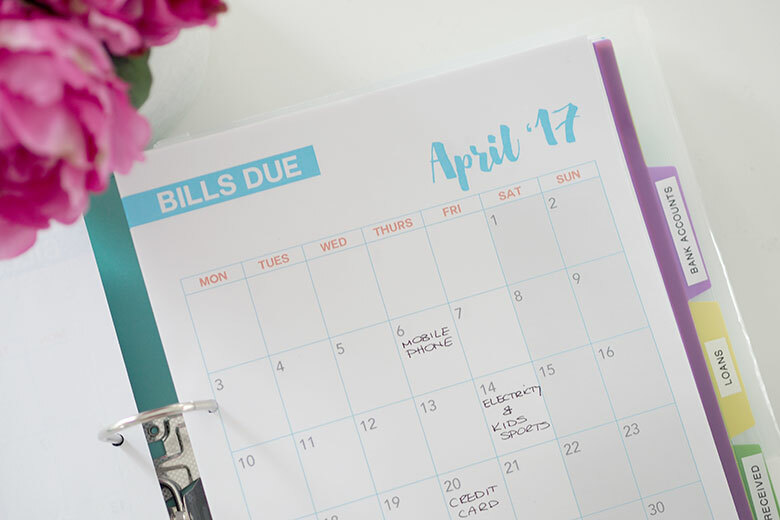 While it’s a regular occurrence, it can still be overwhelming at times to get bills through the year and not know what’s coming. But Origin Energy has recently launched an option to help with this, and it means that their customers pay the same amount for energy every month, for 12 months. ORIGIN’S PREDICTABLE PLAN – Predictable Plan is an option which allows Origin customers to pay a fixed amount every month for the energy they use. This means you’d know the cost of your energy for a whole year. No matter how much you use! I like this A LOT as our energy bills are ‘unpredictable’, with some bills surprisingly higher than the last; this could be because we have used the air/heater more, pool running longer during the warmer months or I’ve used the dryer a lot more etc. So, regardless of how much electricity or natural gas you use, using Origin’s Predictable Plan you will pay the same amount for your energy each month or fortnight. Helping you budget – Predictable Plan will make budgeting so much easier, just like gym memberships, mobile phone etc, now you will know what you will be spending on your electricity and gas, so you’ll be able to manage your finances and can reap great reward when it comes to your family budget, helping you plan for the fun things in life, like family holidays, new appliance or winter clothes etc. If you’re not an Origin customer you can easily switch over, then after three months of billed usage you’ll be eligible for Predictable Plan. In previous years I would keep copies of the bills received in the mail in my Bill Organiser, however times have changed and we don’t receive many bills by mail anymore, instead we get copies via email. Businesses are coming up with new and improved ways for us to pay our bills and try to take away any hassle involved. DIRECT DEBIT -it’ll automatically pay your bills straight from your bank account or credit card when they’re due. BPAY – make the payment by internet or phone banking. When we receive our bills by email we save a copy of the invoice, (with some energy companies – Origin included, you can see these bills in your online account), however I also save it on my computer. I rename it to help me easily identify the period this invoice was for. ie. below I have an invoice for our Jan-March electricity. I keep all invoices within folders for each provider, then by year. These folders and dividers are available from Kmart. I have a cabinet in our home office that is perfect please to put my new filing system. I have used the 3 categories listed above, in each I have placed plastic dividers which I have labelled for easy identification. 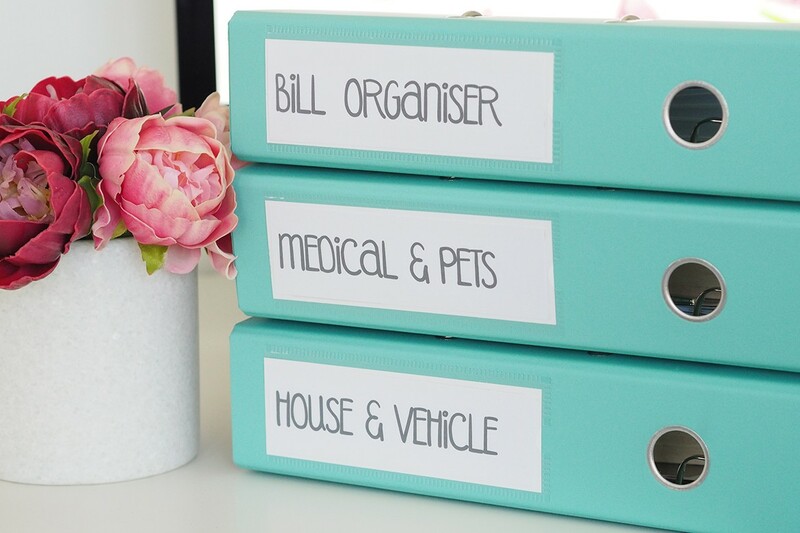 BILLS – I use the pages of my Bill Organiser to keep information such as our bank account, credit card and loan details all in one place. 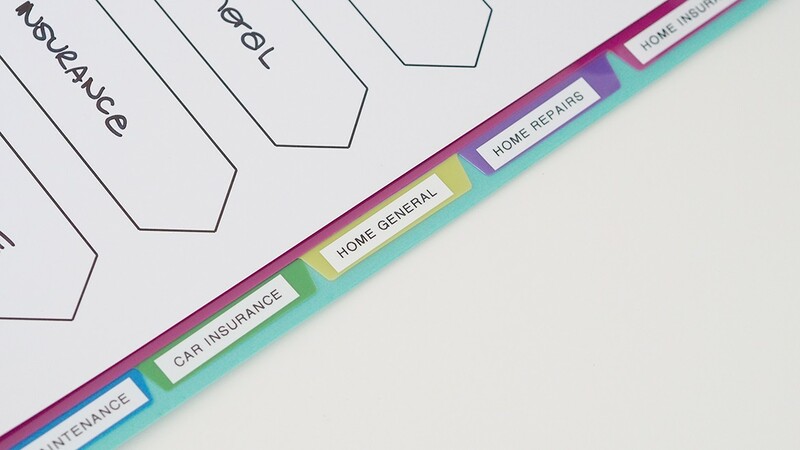 Divider labels: Bills Due, Bank Accounts, Loans, Bills Received, Tax. I also have plastic sleeves behind to store all my receipts for tax purposes. 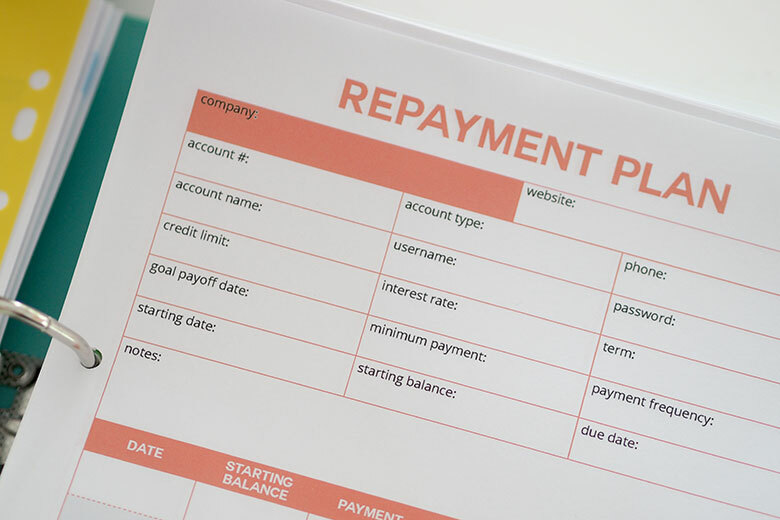 The repayment plan allows me to keep track of how much we still have owing on our loans. I also use these pages to keep track of money the kids have borrowed from me. HOME & AUTO – In this folder I keep all home and car insurance details, along with maintenance records ie. a copy of the invoice for the last car service so we can keep track of what has been repaired. As well as repairs we have had to do around the house, to the airconditioner, pool etc. MEDICAL & PETS – When I visited the doctor recently for the kids and myself, she printed out information that I can take home and read, along with pathology sheets to have on hand to get my cholesterol checked in 3 months time. I have labelled the dividers for each family member to place information for easy reference. Plus… can’t forget the pets, I keep all our cats vet bills in her divider so I can easily look back and see what they performed during her regular check ups. I file away all the items mentioned above into the folders when I receive them, I don’t store them anywhere to file later as I know it will just keep piling up, filing piles bug me. So for me, it’s easiest to do it straight away, like the one touch rule. In the top section of my filing area I have two magazine files. One is for kids school notes that I need to action, once actioned (ie signed) it then goes elsewhere. The other magazine file is for unopened mail, once opened it’s then dealt with and filed away. I also keep pens here which the kids can use, as I have my favourite pens on my desk and it drives me bonkers when the kids take them and I can’t find them. All of our very important information such as birth and marriage certificates, passports are kept in another safe location. I have a different system for all the kids schoolwork which I am yet to share with you. I hope this system can help you organise all your paperwork in your home. 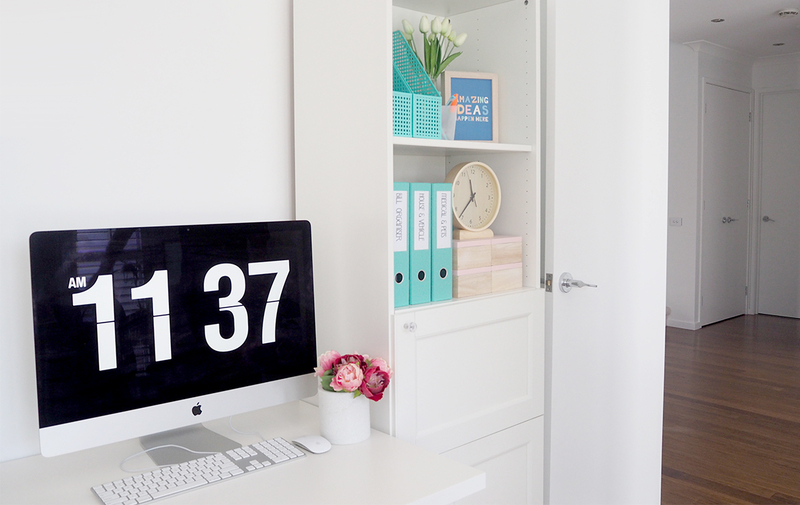 What do you struggle to keep organised in your home office? Absolutely I should share how I organise photos and more! Love the idea of your system though it seems to work for you which is fab!! I would definitely love to see how you organise photos and especially creation of photo books/albums. I have 3 kids and cannot work out how to begin albums…I wanted to do a first 5 years photo book for each of them but then I get overwhelmed thinking at what point do I have a single family album ? Will be a big job! I have wanted to make a filing system here at home for so long, but had no idea where to start, like you, we don’t have a filing cabinet and I couldn’t think of an idea on how to file them… why didn’t I think of folders. Thanks Kat, I’m going to add this to my weekend list of things to do!! Love this space Kat so fresh, you have inspired me to sort through my pile of paperwork and create a better system. Sounds like a really easy system Carmel!! I love what Carmel said and her system. I’d like to know what she has them labeled? This space looks great. I have files on a floating shelf but feel they are becoming too heavy for the shelf. Could you please tell me where you bought the cabinet from that you have the files on. This is my school holiday project. I love floating shelves, so stylish, but yes they can’t get too heavy. This is a Besta unit from Ikea. I signed up to that Predictable Plan just recently, I think it’s going to turn out in my favour of a course of a year, but mostly like you say Kat, it’s great to know now exactly how much I am paying each month. It will certainly help when it comes to the family budget knowing exactly what you are spending each month!! And to add to your system Kat, the ATO now have an app where you can photograph your receipts, etc, for tax purposes. Its relatively new but might help reduce your ‘paper foot print’ even more!! Health Funds are doing the same for medical claims. Brilliant!! Most businesses are getting on board which is fabulous to see. wowsers I didn’t know that Pauline thank you, it looks like everybody is going digital, saves with paper clutter! We have rental property so my files are pretty full. I store a lot of files I have to keep long-term on my Google drive. I use an app called cam scanner to “scan” receipts and I email them to an email address I use only for rental. You could set up a special email address to use for any business or for teachers supplies or whatever. So many businesses are changing to sending all bills digitally, it does help making it easier to store the paperwork. Love your system, it would certainly make it easier for you. What app is on your computer? I love the big clock as the screensaver! Thanks so much. This is really useful as I am drowning in paperwork at the moment!! I would love to know how you organise photos. My New years Resolution for the last 5 years has been to organise my photos but each year when I go to start I get completely overwhelmed! I have hard copy photos plus lots of digitally saved photos on computers and harddrives. Where to start?? Hi, love how neat it looks and the colour choice. Can I ask where you got the boxes on the shelf under the clock I have been looking for something similar. 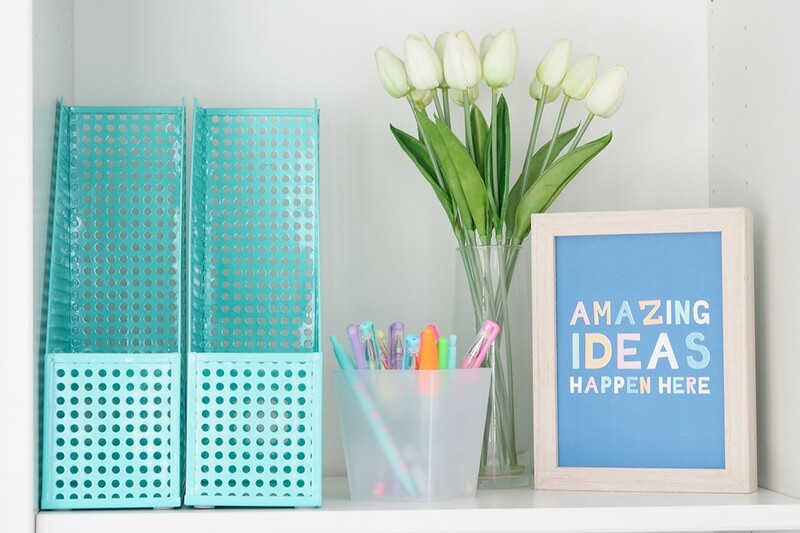 Hi Leanne, these are from Kmart, the store all our extra stationery, ie, lead pencils, tape refil etc. Thank you, off to kmart I go. You have given me inspiration to get my study looking neat. For how long do you keep paper for. I having folder systems in place but not sure how long to keep information for? Check http://www.ato.gov.au for how long to store taxation records. Check with the relevant sources of the paperwork as to how long to keep them. Was wondering where/what you do with your paperwork when the new financial year starts. How do you store these items? Hi Sherelle I will put the past financial year in our filing cabinet, but if you don’t have one I would suggest an archive box for past years. 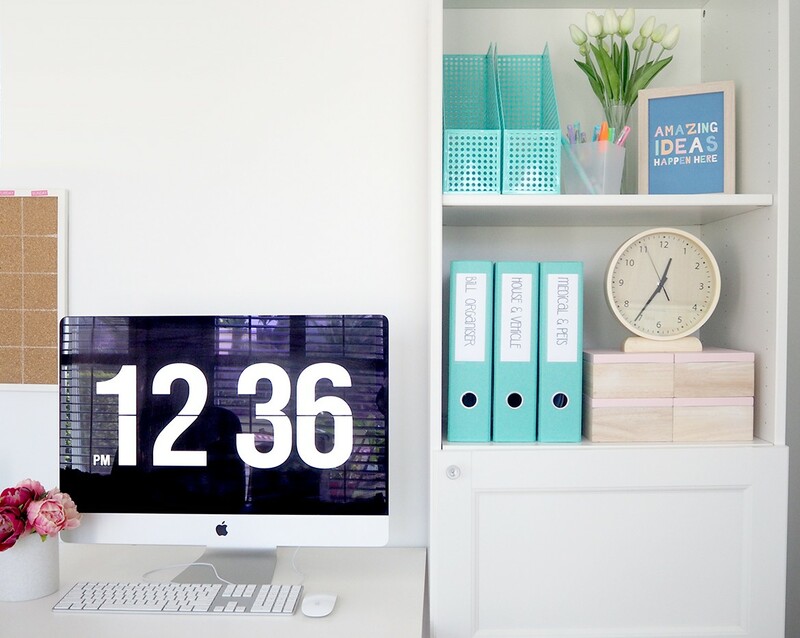 Excellent use of space utilising folders rather than a filing cabinet. Our set up is exactly the same as yours. Filing cabinet is now in the garage and I NEVER file things away. I’m going to sort into piles, start using folders for my main groups and get it organised into a workable system. This area is my only problem – for the longest time. Now I have a plan at least! I already am with Origin and pay an amount each week, it is the BEST way and the bills never bank up. It’s a great feeling getting the bill each quarter and it’s either already in credit or I have the tiniest amount to pay. that must make budgeting so much easier for your Megan! I love your binders where did you get them? Hi Kate! In the article it says they were available from K Mart. They’re gorgeous, aren’t they?! ? Thanks Megan, yes Kate they are from Kmart. I have a paper filing system for the things that I haven’t yet gone electronic with, but I have discovered a very handy (and visual) way of keeping track of bills that need to be paid. I pay most things on credit card, but for things such as credit card statements I set up a BPAY transaction dated in advance for the due date as soon as I receive them, and then put them in a filing pocket until the end of the month. Since I don’t want to pay the rest of my bills with credit card until they are actually due, I place them in a mini clipboard folder until they are due, but the trick is, as a bill goes into the folder I remove a little plastic Post-it flag with the name of the bill on it (e.g. Telstra or Origin), and place it on my family wall calendar on the day that the bill is due to be paid. A quick glance at the calendar tells me when I need to pay my bills. As a bill is paid I put the Post-it note back into the clipboard folder with the other Post-it flags to re-use and move the bill to my filing pocket for checking to the next credit card statement when it arrives. It also helps that my hubby can see when the bills are due and can either remind me or pay them himself to save me the bother. your system sounds great Leah, I love learning how others do it too!! I use a binder for my bills to be paid . i have dividers -Jan–Dec and the bills go straight in to the moth they are due. I am not very good with technology so if anyone has any advise on how to go papeless on the computer I would love some help. I’m just not sure how to create files to store incoming bills so that they dont get missed. Thank for your good idea.I alway have problem with my mess paper in my office. Hi Kat, so it has been over a year since I’ve implemented your folder system instead of the filing cabinet. What a great swap. Not one rego paper has been misplaced, all certificates are where they should be, I had an issue with the home insurance yesterday and found the policy in 20 seconds. All bank statements (from separate accounts) are still all organised and best of all everything is just as organised as the day I did it. I no longer have that overwhelming paper pile feeling. I am still using a filing cabinet, but recently purchased a desk that has a filing drawer. That means the things I access frequently are within reach and other files are in a two-drawer cabinet. Years ago my cat daughter bought me a life organizer binder, but it didn’t work for me long term. One thing I’m horrible about is filing and processing paperwork right away. I just moved a few months ago and I have a seemingly endless amount of papers to go through and filed out discard. There is so much to go through when taking care of a house and children that I feel overwhelmed if pressed for time. I’m going to try processing paperwork at the beginning of end of the day every day. That should help me to keep a handle on things. This is a great post with a lot of helpful tips. Hi Katrina, Im just curious If you still store all your files on your computer or use things like dropbox? Im just starting to move to digital filing instead of paper but I also dont want to slow my computer down too much? Very nice tips for finance, thank you to share this guide line. Hi Katrina, just wondering what font you used for the labels on the outside of your binders? I love your system! I have a question about the inside of the binders. How do you store the paperwork inside the binders? Do you put each individual paper in a plastic sleeve or do you have folders? I’m working on switching to binders and trying to decide how to handle medical statements, receipts, etc. Especially receipts that I need to keep since they are smaller. Love your electronic bill filing. Just wondering how you record or note the date you paid these bills? I would write that on my paper copy usually so looking for a new way.